As a child I became so used to my mother pottering around in the garden that I never gave her actions a second thought. She would stop off at nurseries on the way home from school and plonk plants in the boot of the car – it never occurred to my brother or me to query this practice. She would spend hours in the garden digging holes or moving plants around, but we thought nothing unusual about this and indeed, it wasn’t until I became middle-aged that I began to understand the importance of nursery stops; digging holes or the sheer pleasure that gardening could bring. You could say I was a late developer, but I suspect that in reality I am no different to many other women, who only come to love the garden when they have a little more time on their hands and the genuine maturity to understand what a garden brings in terms of satisfaction and solace once the children have left home. In the last five years, I have learned that a garden is actually not dissimilar to a young child – you nurture, cajole and hope that your efforts will be fruitful; you suffer agony when a particular specimen struggles to survive; and you wait anxiously to see how a plant will fare in a particular place. You feed and water your plants just like infants; you suffer huge anxiety if they don’t grow; and on reflection, the only real difference between plants and children is that you don’t have to change their nappies or wash their clothes and most importantly, they can’t answer back! As I started to plan my own garden a few years ago I also discovered the joys of visiting public gardens; learned the difference between good and bad nurseries; and found myself noticing the seasons more. I also learned to be patient because a good garden takes years of planning, investment and foresight – not dissimilar to a dependent child. The last five years have been a voyage of discovery for me – my garden has become an extension of my personal life and I have learned that few activities bring me greater pleasure than to see the foliage growing; the way the garden changes each season; and the constantly changing landscape provided by my small army of dependent plants. And this prompted me to become a peripatetic gardener travelling to visit gardens around Britain and indeed, the world, which has led to many exciting and wonderful encounters along the way. An enormous amount of research went into my garden visits, not just because of the British weather, but I hoped to maximise on my time by choosing two or three gardens in a given vicinity and visiting them all in a single day. But I soon discovered that this strategy required many hours of research on the Internet to make sure that the venues I had chosen were open on the same day or the same month. I know I could never have written this blog without the help of the web – there are many brilliant garden websites and organisations that were invaluable to me in my planning of this journal – they are all named in the information section at the end. But once again, it was interesting to see that each of these websites has its own agenda and I have to assume that it is driven by advertising revenue. Few of the sites help each other and without exception, I had to use all the different websites mentioned to plan the itineraries that I have outlined in this blog. 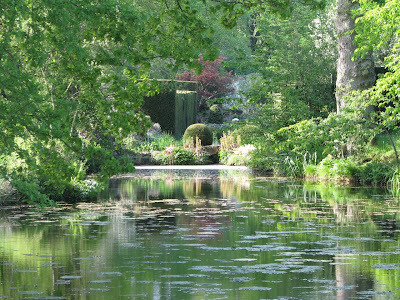 But as I have discovered in my travels, one individual’s perception of a wonderful garden can be very different from another, and it is important to say that the gardens I have chosen in this blog are personal and therefore subjective choices. As a large part of my search involved visually pleasing gardens that I could capture through the lens, my quest was therefore complicated by my need for unusual and uncrowded gardens. I soon realised that I would have to beat both crowds and weather, and the only way to do this was to work out how many gardens within easy reach of each other I could catch on a sunny day, by marking them up on a map, checking the weather forecast the day before and if necessary, changing my plans to catch the sun in Sussex if the weather was coming in from the east, or rush to Kent if the rain was moving up from the west. Needless to say, I got it wrong on many occasions and would find myself taking shelter under trees, or more often, in one of the inadequate cafes that are associated with so many visited gardens, drinking tea that tasted like turpentine or eating a scone that felt like it had been baked when they were first invented. I certainly learned that British catering leaves much to be desired, and although this does not apply to the great gardens that focus on their restaurants, it makes me realise that great gardeners should stick to gardening and not attempt catering. The other vital ingredient to this voyage was becoming a member of key institutions – notably the National Trust, the Historic Houses Association and the Royal Horticultural Society. I started the year armed with these three valuable memberships and they opened the doors to the majority of the gardens that I have written about. Thanks also go to my family and friends at the end of this voyage of discovery because they have suffered my constant absences, ventured out with me when they felt courageous, and never once complained when I announced that I was off in search of yet another garden. I hope that this journal will prove helpful to other gardeners who have limited time on their hands and perhaps they will follow some of the routes that I have taken in this voyage of discovery. Hello from another keen gardener! This is such a lovely idea for a blog - very useful and interesting. I'm sure it will inspire people to visit English gardens. I visited Vann last summer, and wrote about it with a few photos on my blog. It was a garden I had wanted to visit for a while as it had areas designed by Gertrude Jekyll, although these were somewhat overgrown when I eventually made it for an NGS opening there. I love garden art. All your photo look great specially the ones in which the lovely gardens are with great houses. Nice blog also. I totally agree with you concerning the passion for gardening. Its not about achieving the perfection rather the journey of constant sowing, planting, pruning, reaping and going thru the cycle all over again. Keep up the good work. How lovely to discover your blog Charlotte! From English gardens, famous and un-, to visions of India, I have enjoyed paging through it and will be back! So please to find a common soul! I will read with interest. What a great introduction to your blog - I look forward to dipping into it regularly, as well as finding out what you have already covered in terms of gardens. We too are pretty adept at fitting in several visits on one day, although sometimes our paths may diverge and one of us (not me) might go to a bird watching place instead!